The best crop harvests in six years – and the tremendous boost this has given the area’s agricultural businesses – has prompted young people to stream into the Breede River Valley in search of both employment and homes. And the arrival of a slew of new residents has also caused property values to climb steadily, he says. “For example, in Swellendam and Barrydale, where a 100sqm three-bedroom home now costs around R1,4m, house prices have seen a healthy 10% increase since last year. Meanwhile Robertson, located in the heart of an officially recognised Wine of Origin region (and the Cape’s largest irrigated wine-producing region), has seen house-price growth of nearly 7% this year, according to Mardi Botha, the resident Chas Everitt International property consultant. “We’re selling an average of six houses a month to both young professionals who are starting local businesses and older people from Cape Town and Johannesburg wanting a taste of country life. Small ‘lifestyle’ farms are very popular as either weekend retreats or to set up as guesthouses and they sell for between R3m and R5m. “Properties in the new Silwerstrand Golf Estate on the outskirts of town are also selling like hotcakes. We have some 50 properties available there at prices from R1,8m to R3m,” she says. About 20km to the south, in the foothills of the Riviersonderend Mountains, McGregor is attracting equal attention. “When I arrived here seven years ago a small two-bedroom cottage would have sold for around R700 000. Today, these properties are going for R1,3m to R1,4m,” says Shaun King, who heads up the Chas Everitt International franchise in the village. Demand similarly exceeds supply in Montagu, which, like McGregor, falls within the Langeberg Municipality. “Our stock has been significantly depleted in the last 24 months due to the town’s popularity. Property values have increased as much as 30%, with the average house now selling for R1,45m,” says Nelda Wiese, who operates the Chas Everitt International franchise in Montagu, which also serves the neighbouring towns of Ashton and Bonnievale. “While we do have a small percentage of ‘swallows’, Montagu is increasingly attracting young families and our buyers include entrepreneurs and those in the hospitality industry who are taking advantage of the upsurge in tourism that the town has experienced in the past few years,” she says, noting that this appeal will only intensify when the major improvements that are currently being made to the pass through Cogmans Kloof – Montagu’s access road through the Langeberg – are completed in four years’ time. 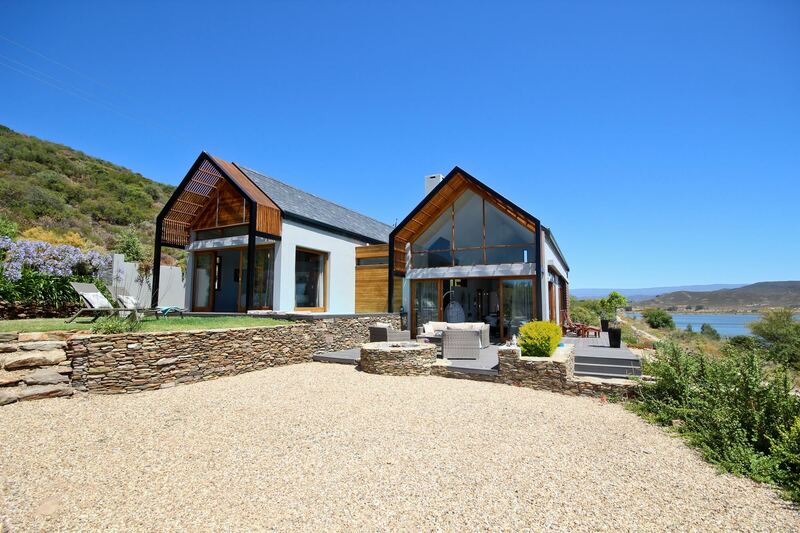 Just 2km from Montagu, this two-bedroom contemporary home is for sale through Chas Everitt International for R3,95m. Double-volume living spaces are complemented by impressive dam views from all the rooms. For more details see www.chaseveritt.co.za, ref 13246578. Situated on over 5000sqm of land, this four-star guest lodge in Swellendam is for sale through Chas Everitt International for R6,95m. In addition to a spacious main house it features six guest suites, each with its own private veranda. For more details see www.chaseveritt.co.za, ref 13340319. This two-bedroom Victorian style cottage in Robertson is for sale through Chas Everitt International for R1,45m. Situated a stone’s throw from the centre of town, close to schools and a hospital, it boasts a low-maintenance garden with river access. For more details see www.chaseveritt.co.za, ref 13405804.